Let’s end the year on a sweet note! 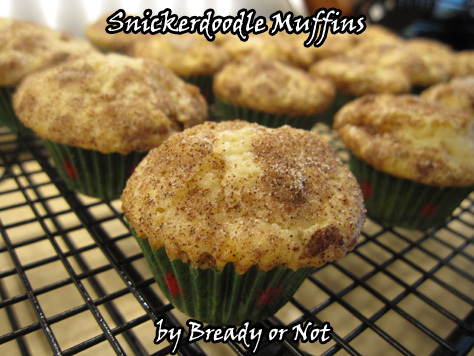 How about some Snickerdoodle Muffins for breakfast or dessert? These things taste and look just like the cookie version. From straight overhead, they even look like cookies! 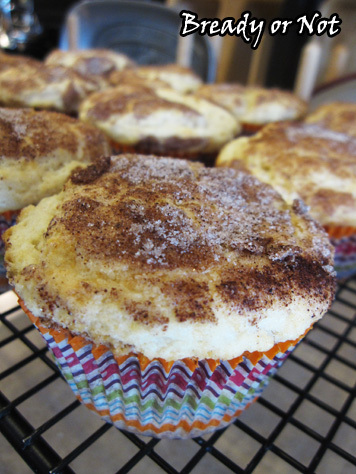 The muffin texture is light and fluffy. This is because the butter and sugar are beaten to fluffiness, and then the sour cream creates tenderness without any negative impact on taste. The dough is thick enough to be rolled in cinnamon sugar. I have made this as normal muffin size and as mini muffins. Both are fabulous and freeze well for later eating, too. Unless you plan to eat them the first day, do store them in the fridge. At room temperature, after two days they go really spongy and soft, but they can be saved by sticking them in the fridge or freezer. Many of the sweets I make go with my husband to work, but not these. He adores Snickerdoodles. These are all for him. 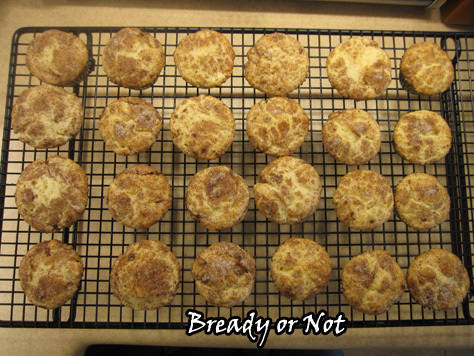 Snickerdoodles in muffin form! This recipe makes 11-12 normal-sized muffins, or 22-24 mini muffins. They keep in the fridge for days and can be frozen, too. Preheat oven at 350-degrees. 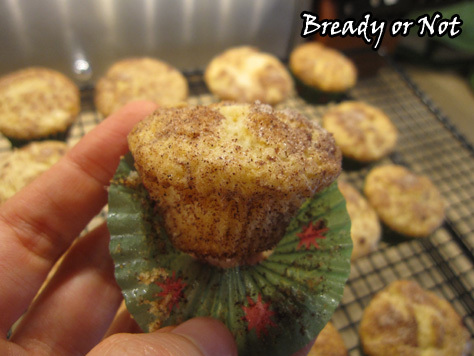 Prepare a 12-cup muffin tin or 24-cup mini muffin tin by adding liners and spraying them with Pam. With a mixer, cream together the butter and sugar for about three minutes, until it's light and fluffy. Add the egg. In a separate bowl, sift together the flour, baking soda, baking powder, cream of tartar, and nutmeg. Take turns adding the flour mix and the sour cream to the butter-sugar mix until everything is just combined. Prepare a bowl with the topping sugar and cinnamon. Use a 1/4 cup or scoop for large muffins or a teaspoon scoop for mini muffins, and dole out a ball of batter into the topping mix. Roll it to cover it, then transfer the ball to the prepared muffin tin. 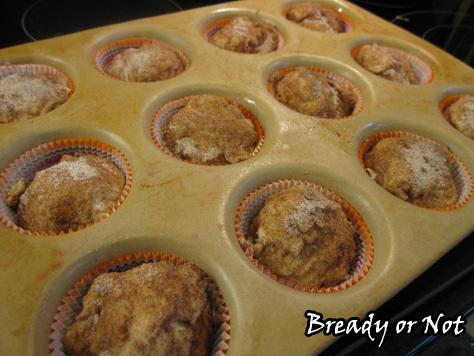 Bake large muffins for 21-24 minutes; bake mini muffins at 12-14 minutes. Do a toothpick test to ensure doneness. Let muffins cool in tin for about 10-15 minutes, then use a fork to gently pry them out to set on a rack to finish cooling. Note that muffins keep best in the fridge. At room temperature, they will go very soft after about two days, but can be revived by being popped in the fridge. 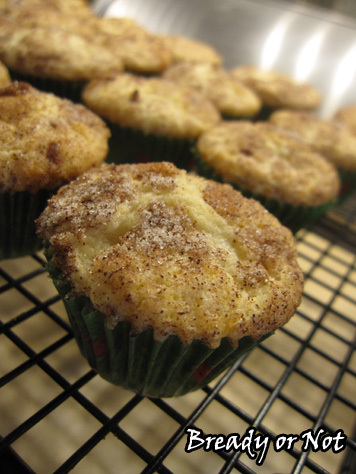 Muffins can be frozen for an extended time, but remember to remove the liners before freezing.